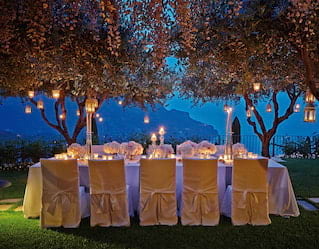 Ancient frescoes, panoramic coastal views and irresistible Italian cuisine make Belmond Hotel Caruso the perfect venue for Amalfi Coast weddings and celebrations. Our dedicated team of event planners, bespoke menus and top-of-the-line equipment ensure everything goes smoothly on the day. Sun-drenched terraces, intricate ceilings, breathtaking views... This 11th-century palace sets the scene for romance. Take your vows in the enchanting 900-year-old Duomo of Ravello. Entertain guests amid rose bushes in the fragrant Italian gardens. Or treat them like royalty with exclusive use of the hotel, courtesy of our Ultimate Take-Over. 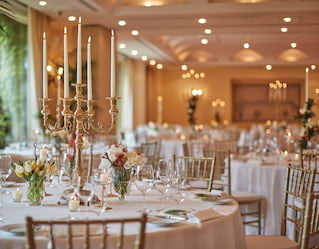 Whatever your dream wedding, our dedicated team will make it a reality. 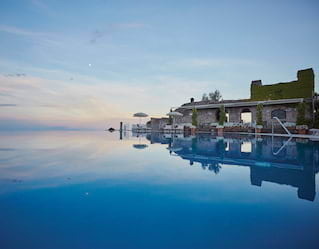 Few honeymoon destinations compare to the Amalfi Coast. Enchanting roads wind between emerald mountains. Picturesque towns overlook an endless blue sea. Colourful houses cling to the cliffs. Spend days wandering world-famous Positano, Sorrento and Amalfi or strolling the chic streets of Capri. For pure decadence, don’t go anywhere at all—simply pull up a sun-lounger, order a glass of champagne and bask in the hotel’s breathtaking surrounds. Whether it’s a family reunion, wedding anniversary or milestone birthday, plan a breathtaking banquet in the secluded grounds of the hotel. With outstanding regional cuisine offering up the best of land and sea, Belmond Hotel Caruso can turn a dinner date into something magical. With private dining facilities seating up to 170 people and 50 rooms and suites available, there’s an endless choice of enchanting options. Our exclusive incentive activities are sure to impress. Stroll through fragrant lemon groves, learning along the way about the traditional cultivations methods still used today. Uncover Amalfi’s secrets with a guided starlit stroll. Pause on a hidden terrace overlooking the harbour before toasting “la dolce vita” with prosecco in Atrani. 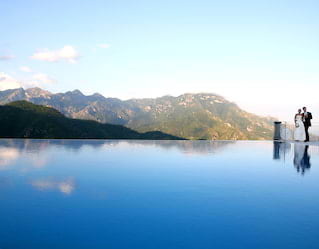 Or for the most spectacular thrill of all, witness Amalfi from the sky on a private helicopter ride. Celebrations at Belmond Hotel Caruso are nothing short of show-stopping. For the party of a lifetime, why not treat your friends and family by booking the entire hotel? Stroll in the leafy gardens, swim in the infinity pool or sip a cocktails at the bar, surrounded exclusively by your chosen guests. And with our dedicated team giving you their full attention, expect every detail to be just perfect.